If you’ve never seen a halibut, you need to see one. These white and brown camouflaged floor dwellers that flourish on Alaska’s continental shelf are large, flat fish that have their eyes on top of their head. On average they weigh 20 to 80 pounds, but can weigh up to 300 pound. 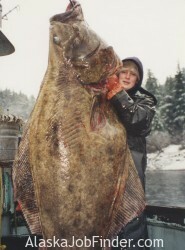 The record halibut was 12 feet long and over 600 pounds! But the one thing that is better than seeing a halibut is catching one. Fishing for halibut is both a commercial business and one that sport fishermen love. Imagine the fight to land a monster halibut… It must be exhilarating. And it would be a pretty amazing job to get paid for fishing for the world’s largest flatfish. Alaska is proud to have one of the most productive halibut nurseries in the world. In fact 3/4 of all halibut fishing occurs in Alaskan waters. When you calculate that a fisherman gets $5 to $6 per pound and 21.45 million pounds of halibut were harvested in 2016, you can see why the Alaskan Halibut fishery is a lucrative place to work. There are over 2,100 halibut fishing boats in Alaska. Each boat requires 4 to 8 workers. When you do the math, that’s a lot of job opportunities. 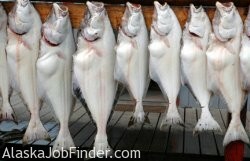 Use AlaskaJobFinder to help you find a great job in Alaska! The North Pacific Fishery Management Council (NPFMC) utilizes Individual fishing quotas or IFQs to help regulate the Alaskan Halibut fishery. IFQ shares are divvied up to fishermen and companies. The shares can be leased, bought, or traded and they determine the amount of halibut you can catch. The regulations also determine where and how fisherman can fish. This helps keep the halibut population healthy and sustainable. If you have a few IFQ shares, it’s easy to find a job. The more shares a crew has, the more money they can make during the season. So be sure to talk with your crew and skipper before you sign on for the season. It may also be wise to look into who the top quota holders are and see if they are hiring. If you think you have what it takes to haul in halibut for the summer, the Alaskan halibut fishery is the place for you. This fishery is rich with excitement, fun, and solid paychecks.